Hi Honest Bob, I've fixed it!!!!!!!!! 'It' being the original subject of this post - my NZ model SC-3000. I desoldered the T101 circular transformer, did a few checks, wired up the 12v rail to my bench PSU - wow - instant video fix! 12.0V - Colours a bit better. 9.7V - Great saturation, banding gone! 9.0V - Acceptable colours, slight shimmer. Q. Why not just run the whole daughterboard off 9V? Or, convert to run off 12, chuck an extra regulator in, to feed the main 5v regulator (12 to 5 would be lots of heat in one place) and maybe a fat diode to drop the 12 to about 11.2 volts for the video daughterboard. The shimmering/banding I can see changes frequency with voltage - so reckon could be eliminate with a fews caps in right places. I will take some voltage measurements a few minutes apart on my video daughter board and see if the voltage level stays consistent or drops. It would be great if that is the cause of the colour fade problem. There are a lot of components on that daughterboard, so it would be a pain to start replacing them one at a time as an elimination test. Can you try running yours for say 30-60 minutes with a stable voltage level off your bench PSU and see if you can notice any colour fade? Once you are looking for it the effect is quite obvious. It helps if you have a game with red on black on the title screen or similar as that is where it is easiest to spot. I did some simple temperature tests on mine the other day. I bought an inexpensive little infra red temperature gun off eBay a few months back. It is handy for looking for hot components if you don't care about getting exact measurements. Most of the daughterboard components shifted from about 23 degrees cold to the low to mid 30s after running for a few minutes, but nothing was screaming out that it was overheating, including the T101 transformer. Just from an ease of modification point of view, and for stopping other people plugging the wrong power supply into the SC-3000 in later years, I would stick with a 9v power supply. It would be preferable to keep the mods close to that daughterboard. I guess the other alternative is if there is a simple replacement for that DC transformer that will give a consistent 11.2v output without needing a big heat sink. I think there is a trimming capacitor on the daughterboard TC101. I haven't touched mine yet. Does that have any effect in your testing? By the way - I'm planning to order some spare MCM4517 64K x 1 DRAMs. They look like they are around $3 to $4USD each. Do you want any spares for your Yeno SC-3000? Yes please, I have 1 x 4116 that has flat-lined its Q output, so I'd be keen to buy 2 of them, we can split the shipping! You in Auckland? Will PM you my details. Am also after a few 4416 chips for repair & upgrade my 2 x stuffed Basic IIIA cartridges (one gives 2 beeps, one just gives that medium tone) - know a good source of those? Pity my junk Jaycar solder sucker can't deal with through-plated (it's actually crud, I shall return it) - and am hopeless with wick, I want a good vacuum gun! Re running video off the 9v or 12v direct, I found that voltage drops enough to cause loss of colour on the board. Also, too many late nights, of course the correct answer is repair that part of the circuit. The T101 looks OK, I am having flashback to my original NZ Sega SC-3000 which went to the hospital for an expensive repair (symptom was blank video, same!) - well it turned out it was the power transistors on the video daughterboard, but they were different package transistors, very distinctive-looking (similar to image below). Now I don't know if they were original, or the replacements. I notice some of these package transistors are described as 'video transistors' and 'suitable for DC-DC' - which am guessing means they can handle lots of fast switching. Hmmm, I'll check those trannies out tonight and see if that's my problem. natshaw wrote: Yes please, I have 1 x 4116 that has flat-lined its Q output, so I'd be keen to buy 2 of them, we can split the shipping! You in Auckland? Will PM you my details. Ok, I'll see what I can track down. Just waiting on an answer on whether they ship to NZ or not / cost. I'm based around Albany in Auckland. natshaw wrote: Am also after a few 4416 chips for repair & upgrade my 2 x stuffed Basic IIIA cartridges (one gives 2 beeps, one just gives that medium tone) - know a good source of those? Pity my junk Jaycar solder sucker can't deal with through-plated (it's actually crud, I shall return it) - and am hopeless with wick, I want a good vacuum gun! eBay is the magical place where old chips go to die You can usually find exactly what you want at a reasonable price with reasonable shipping. That's where I'll get the MCM4517s from. I've only had one package go astray since I started using eBay a couple of years back. I also have four 4416 chips you can have from a IIIB cart I sacrificed whilst developing the multicart. You will have to desolder them though. No guarantees they work, but you're welcome to try. I know what you mean about getting a proper vacuum gun, although I'm not too bad with desoldering braid now. The real problem is if you want to save the original chip. That's when you have to put lots of heat into the board and risk lifting traces and damaging parts. If you don't care about the chip you are removing then using side cutters to cut it off the board followed by a quick clean up with desoldering braid. The two beeps means the cart is failing the memory test. That *could* be a cart port problem rather than the chips, although less likely as your games carts seem to be responding ok. Another common cause would be dirty contacts on the cart PCB. I also think I have some spare basic carts around the place if you just want a working one. natshaw wrote: well it turned out it was the power transistors on the video daughterboard, but they were different package transistors, very distinctive-looking (similar to image below). Now I don't know if they were original, or the replacements. How do your ones compare with the photo I posted of my daughterboard on the first page of this thread? I took a quick look at that and can't see anything that resembles the picture you posted. MCM4517 chips ordered. I'll PM you when they arrive and get a couple out to you. I've had a couple of those die on me now. My main SC-3000 has a very funky VRAM bug which caused headaches during the Astrododge test / release cycle. One of the bits is sticking around where sprite zero is controlled from, so as you fly the ship up and down the screen the body of the ship suddenly jumps 32 pixels vertically away from where it is supposed to be. I spent ages chasing that thinking it was a platform specific bug on the conversion across to the SC-3000 since everything else seemed to work fine. 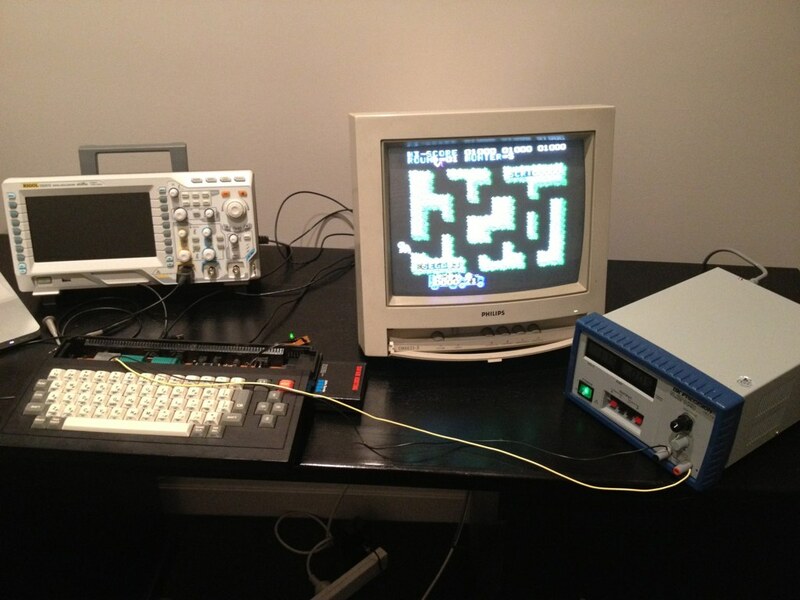 But eventually figured out it was a hardware fault as didn't reproduce on other SC-3000s. (The author, Martijn Wenting from Revival Studios, is in the Netherlands. I've been doing the SC-3000 cart releases for that. They look great - just going to ship most of them back to the Netherlands on Monday). 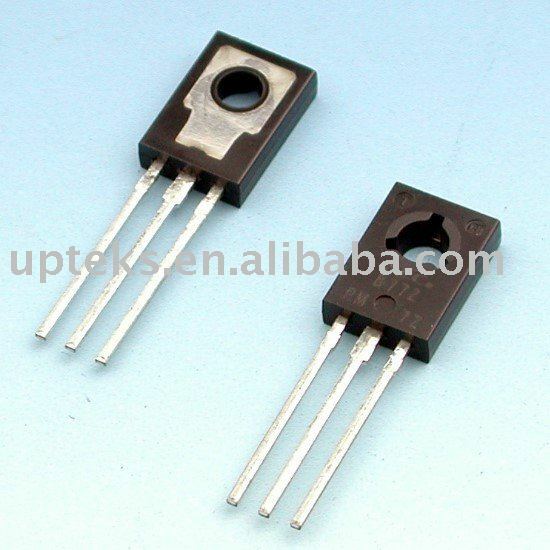 Transistors: The transistors I had previously in that TO-126 (70% sure) package were the pair up by T101 - TR106 and TR107. Mine seem OK (based on quick multimeter diode test), as does my T101, I'm getting closer to finding the culprit. Trimcap - no noticeable video difference when I adjust it. I don't know xtal/oscillator theory, but I suspect the trimcap might not be for frequency adjust, but rather for setting the capacitance the xtal requires in order to be stable. Your video issue sounds odd - did those 11.2v readings you took occur during the issue? Interesting you said you had one (brief?) 12v reading too. I would love to start documenting some test points on these Sega circuits, and especially the video parts (of 6 Sega faults I've had, 4 are/were video, and 2 possibly BASIC cartridge). I probably don't have the time, but I will at least write up the ones I've found so far on my working & non-working systems and post them to appropriate forums. natshaw wrote: Your video issue sounds odd - did those 11.2v readings you took occur during the issue? Interesting you said you had one (brief?) 12v reading too. The 11.2v readings will be unrelated to the VRAM issue and my mystery floating sprite. That is completely consistent with one particular bit sticking, which I've had before. That should disappear once I identify and replace the faulty VRAM chip. I managed to reproduce the 12v reading again. It just seems to happen for a short period after turning the SC-3000 on. Still seems very odd it would change like that. I'll check on another machine at some stage. I tried leaving the SC-3000 running for about 20 mins. The reds gradually started to fade a bit towards brown, but the voltage to the ICs stayed around 11.2v. So it isn't a simple issue of changing voltage levels from the step up circuit. natshaw wrote: I would love to start documenting some test points on these Sega circuits, and especially the video parts (of 6 Sega faults I've had, 4 are/were video, and 2 possibly BASIC cartridge). I probably don't have the time, but I will at least write up the ones I've found so far on my working & non-working systems and post them to appropriate forums. Ta. It is great to have stuff like this searchable for other people who are attempting repairs. Did some initial of direct component video (YPbPr) output - interesting results. SC-3000 PAL edition VIDEO port output progressive (non-interlaced) signal right? That's the key thing. Most scan doublers etc out there are trying to take an interlaced signal and convert it to feed it into non-interlaced (progressive) inputs. Why not go the other way? We already have a progressive signal, in HDTV terms, let's call it '313p50' - 313 progressive frames @ 50 Hz. 313 is half of 626, so it's basically the same rate, timing etc as each half-frame field of a regular 576i (576 visible lines, but 625 lines transmitted) signal that most LCD TVs will happily accept on their component video inputs. Now, when I feed my 313p composite output into my Sony LCD TV's component video luminance (& sync) input, what does it do? It reports '576i', and displays a perfectly sync'd grey-scale picture as expected! So, my current belief (and am about to go test) - is that the entire video daughterboard on any Sega SC-3000 can be bypassed, and the component outputs from the TMS9928 can be fed directly into the TV! As mentioned earlier, some checking needs to be done re impedances and voltages and whatever else, but I know the old TMS9918 had a composite output that could be fed directly into a TV/monitor with MINIMAL effort. Will go do some more digging and report back when I have my Sega SC-3000 working in blazing colour on my 24" LCD monitor and on my 40" LCD TV. Then, I can die happy. Desolder gun! Best investment ever! When I'm done pottering around in the shed I'll see if I can find the wee asian chap's email address who sourced mine, it was like $250 for a good clone of a Hakko 474. Definitely makes working on these old girls much easier, certainly helps working on Commodore 64s and things. Can get a soldered-in CIA out in no time. Carcenomy wrote: Desolder gun! Best investment ever! When I'm done pottering around in the shed I'll see if I can find the wee asian chap's email address who sourced mine, it was like $250 for a good clone of a Hakko 474. Just bought the cheapest I could find on ebay $50 US or so. Will let you know quality once it arrives! Blue handle, has a red push button. no temp adjustment? If so, I have one from our ebay friends in China, it's fine for big joins but small or solder-thru joins and it's a pig.